Black Caviar, the international racing sensation from Down Under has been busy since she officially retired in April 2013! Black Caviar, whose nickname is "Nelly," gave birth to her first foal on September 13, 2014 - a cute bay filly with two white socks and a tiny star - by Australian champion stallion Exceed and Excel! In her unrivalled racing career, Black Caviar shattered records and delivered thrilling performances on two continents igniting international excitement about Thoroughbred racing. Excited fans gathered in the thousands to watch the powerful mare with her distinctive salmon-coloured silks with black dots fly down the track undefeated in 25 of 25 races. Black Caviar was officially rated #1 on the World Thoroughbred Rankings in April 2013 by the International Federation of Horse Authorities, and was the highest rated sprinter in the world for four consecutive years (2010-2013). As of April 2013, she held the modern day world record for the longest unbeaten career in international racing, breaking the records of Australian champions Gloaming and Desert Gold and the U.S.A.'s Zenyatta. She was trained throughout her career by Peter Moody and was ridden to 22 of 25 wins by jockey Luke Nolen. Her filly's sire, Exceed and Excel, is the leading sire in Australia for the 2012-13 season, with 17 stakes winners and more than $11.2 million in progeny earnings. Exceed and Excel was the Australian champion sprinter 2003-2004. With a pedigree like this, Black Caviar's filly has a lot to live up to! CLASSICS Designed for authentic and imaginative play offering younger collectors realistic horses and excellent collectibility, Classics are created with the same care and devotion as BreyerÃ‚Â®'s Traditional line! Sculpted in 1:12 scale. 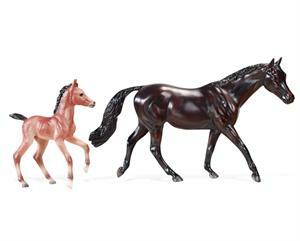 Jack's Country Store is a Blue Ribbon level Breyer Model Horse dealer. 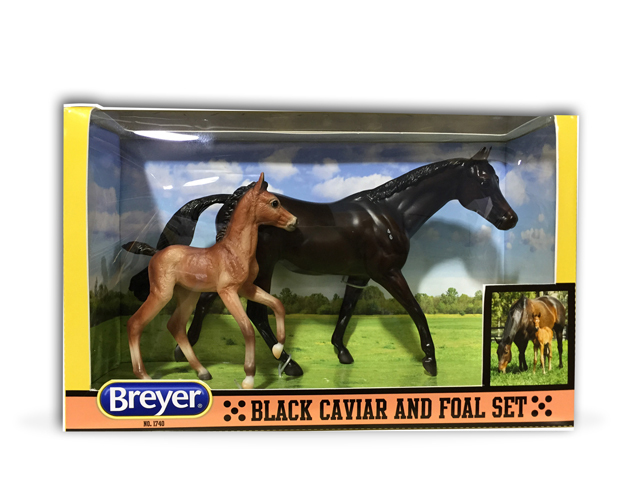 All of our models, including the #1740 Black Caviar and Foal Set are brand new, in original, un-opened packages.